Four popular striker-fired semiautos go head to head on the range. Photos by James Walters and Nathan Reynolds. Recent estimates show that approximately 60 percent of American law enforcement agencies issue some sort of polymer frame pistol. The same features that made polymer pistols so practical for police service were not lost on civilian shooters, who have embraced the genre as home defense, concealed carry, trail and competition handguns. With an ever-growing market, it wasn't long before every major handgun company added one or more polymer-frame pistols to their lines. One of the reasons for the meteoric rise in the popularity of "plastic pistols" was that modern polymers provide equal, if not superior, resistance to wear, abrasion, solvents, oils and environmental extremes than metal-frame pistols. They do not require separate grip panels, allowing the use of high-capacity magazines without increasing the bulk of the grip, which means that people with smaller hands can handle them easily. Polymer frames flex under recoil, absorbing some of the recoil, so they shoot "softer" than heavier handguns. They are also lighter, which is a big plus, especially if you're a police officer who has to carry a gun all day or a licensed civilian carrying one under light clothing. While there are many polymer-frame pistols we could have included in this test, we decided to limit it to four of the .45 ACPs most popular with American police agencies and civilian shooters and thus obtained samples of the Glock 21SF, Springfield XD 45, Smith & Wesson M&P45 and Taurus 24/7 Pro SSP. All four are striker-fired pistols that utilize a variation of the double-action trigger system. Unlike the trigger mechanisms of the Glock, Springfield and Smith & Wesson--all of which require that the slide be retracted slightly to reset the striker when dry firing or to try a second go at a recalcitrant primer--the Taurus has a very light double-action trigger stroke with a single-action type let-off. If the cartridge fails to fire, simply pulling the trigger on the Taurus allows multiple strikes on the cartridge without having to rack the slide to reset the striker. While the M&P was the only one to feature interchangeable grips inserts so the shooter could adapt it to his particular hand size, all of the test pistols proved to have ergonomically pleasing grips. Notes: Accuracy results average of three five-shot groups at 50 feet fired from an MTM rest. Our quartet of handguns featured high-tech metal finishes, rails for mounting tactical lights or laser sights, fixed sights and have magazine capacities ranging from 10 to 13 rounds. Springfield's XD, the Taurus and the M&P45 all featured external safety devices, although on the latter it is an optional feature. The M&P's magazine releases can be switched from port to starboard, but the Glock 21SF and XD come with mag release buttons on their left and right sides. Ambidextrous slide releases were present on the M&P, and all four had some means of providing visual and/or tactile indication when their chamber was loaded. The Glock was the only one that used polymer (albeit metal lined) magazines rather than stainless steel cartridge containers. The only other significant difference was with the Taurus, which had a shorter barrel and grip frame than the other guns. But, overall, the four pistols have more in common than not, so I was looking forward to see how they compared. To do so, I contacted my good friends Larry Mefford, Jim Tosco, Butch Simpson and Paul Brinkman, all of whom are avid action pistol shooters, albeit of varying levels of expertise. Of all the test pistols, only the Taurus 24/7 Pro offers second-strike capability in the event of an ammo-related misfire. It's also the least expensive of the bunch. Smith & Wesson's M&P45 got high marks for recoil control and for its sights. It was also the only pistol that offered interchangeable grip inserts. We decided to run the four pistols through a series of offhand drills that would emphasize handling qualities, real-world accuracy, rapid-fire capabilities, ease of reloading and reliability to find out if any of them displayed significant advantages over the others. A few days before we met, I zeroed and conducted an accuracy test of the four test pistols from an MTM Predator rest at a measured 50 feet--as well as chronographing them--with 230-grain FMJ ammunition kindly provided by Black Hills. All four shot more or less to point of aim and produced groups ranging from two to three inches in size--more than adequate performance for service type handguns. I then disassembled, cleaned and oiled the pistols, which would be the only maintenance they would receive during test firing other than wiping off visible grit or residue with a cloth. If a pistol choked up, the shooter would attempt to clear the malfunction and, if possible, keep shooting. We met at the club on a cold December morning a short time before Christmas to be greeted by the first snow flurries and sleet of the winter. Jim Tosco had designed two stages of fire on which each shooter would engage various types of steel targets at ranges of 10 and 15 yards. Each stage required a minimum of 18 rounds to complete, which made reloading necessary. I was unable to participate in these drills due to an injury, but my friends shot both stages with each of the four pistols (man, did we go through a lot of .45 ammo), timed with a PACT timer and scored with a simple system based upon actual time with added penalties of five seconds for each miss or procedural error. Lacking similar holsters for our test guns, the shooter began each stage holding the pistol at the Low Ready position while a pair of spare magazines were carried in Uncle Mike's belt pouches. As it was my intention to judge the pistols, not the shooters, scoring consisted of averaging the times of all five shooters with each pistol on both stages, which were then added and averaged again. The results are found in the accompanying table. We then moved over to the next berm to try out the four pistols on the club's steel plate racks. The drill here was simple. The shooter began standing 10 yards from a rack with six eight-inch plates, pistols loaded with 10 rounds of ammo, held at the Low Ready position. On the signal, they lifted the pistols and engaged the plates. Once all plates were down, they reloaded and repeated the drill three more times. Scoring was the average time it took all four shooters to run four racks of plates with each pistol. It should be mentioned that before we began shooting plates, our test pistols were already dirty, but by the time we were done, all of them were downright encrusted with crud. we did not experience a single failure to feed, fire and eject with any of them--a testament to the level of quality control exercised by the pistols' respective manufacturers. Springfield Armory's XD 45 was tops in both speed drills and was judged best in class in ergonomics, ease of reloading and ease of disassembly. The Glock 21SF was one of the faster pistols on the plate-rack drill, and all the testers liked its trigger pull. It was also deemed most accurate. Afterwards I asked my four gun testers to rate the pistols using scale of 1 (worst) to 10 (best) numeric scale, and we came up with scores listed in the accompanying table. To complement this subjective rating, I asked everyone to lists any comments they had about each pistol. I found it a bit strange that while they rated the M&P45's sights and accuracy highly, it finished last in the plate stage. Go figure. 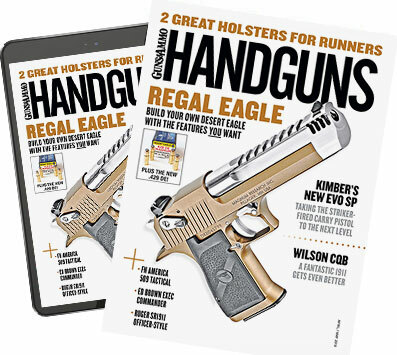 The only malfunctions we experienced were when the Taurus pistol's magazine dropped free, seemingly of its own accord, which happened with two different shooters (once for each). We also experienced difficulty seating one of the M&P magazines unless it was inserted exactly centered in the magazine well. Three of the shooters found the Glock's magazine release a bit difficult to depress. As for trigger control, it came as no surprise that my four assistants--1911 shooters to a man--found the shorter throw of the Glock more to their liking. Everyone was in agreement that the XD 45 had the most ergonomically pleasing grip, although one said that had we installed the large palm swell on the M&P45 rather than the medium-sized one, the S&W most likely would have gotten his vote. Three of the shooters managed to pinch the pinkies of their right hands when performing combat reloads with the Taurus, which accounts for its low score in that category. But in fairness it must be pointed out again that the 24/7 had the shortest grip frame of the four guns. As they say, the numbers don't lie. Granted, a majority of the grading was based on subjective measures, and one man's treasure is another man's junk, but in most cases the scores were pretty darned close--meaning you really can't go wrong with any of these guns, depending on how you weight various handling/ shooting characteristics.